LHASA - Effective steps need to be taken to prevent and crack down on infiltration and sabotage activities of separatist forces, and firmly safeguard national unification and stability in Tibet, said a message from the Chinese central authorities on the 60th anniversary of Tibet's peaceful liberation. A grand ceremony was held Tuesday in Lhasa, capital city of Tibet Autonomous Region, to celebrate the 60th anniversary of the peaceful liberation of Tibet. On May 23, 1951, the Agreement of the Central People's Government and the Local Government of Tibet on Measures for the Peaceful Liberation of Tibet, also known as "17-Article Agreement, " was signed in Beijing, marking the peaceful liberation of Tibet. 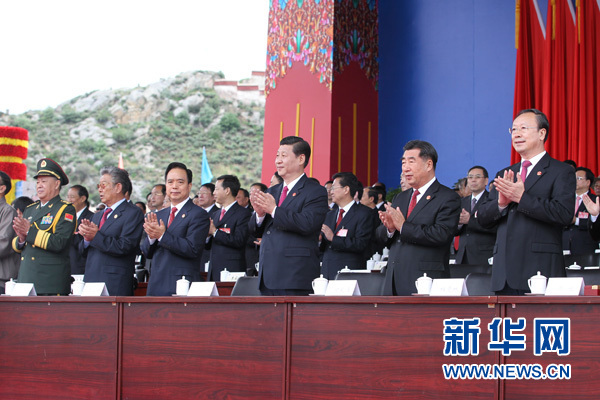 A delegation of the central government led by Vice President Xi Jinping on Monday evening attended a celebration gala marking the 60th anniversary of Tibet's peaceful liberation. The delegation members joined more than 850 attendants at the gala titled "Sing a Folk Song to the Party Again", which was held at the People's Hall of Tibet. The gala was staged by about 1,000 performers consisting of both professional performers and local Tibetan farmers and residents. Xi, also a member of the Standing Committee of the Political Bureau of the Communist Party of China (CPC) Central Committee, is heading the central government delegation to celebrate the 60th anniversary of Tibet's peaceful liberation. The 59-member delegation arrived in Lhasa, capital of Tibet Autonomous Region, on Sunday.